Das Racist is a rap group based out of Brooklyn. They’re composed of Himanshu Suri, Victor Vazquez and hype man Ashok Kondabolu, better known as Dap. Be sure to check out their new mixtape Sit Down, Man. It’s pretty fresh… Bless up! Now here’s something Un. Herd. Of!!! TRU night club, located in the heart of Broad Ripple Village is putting on a ‘Penny Pitcher Tuesdays’ event. 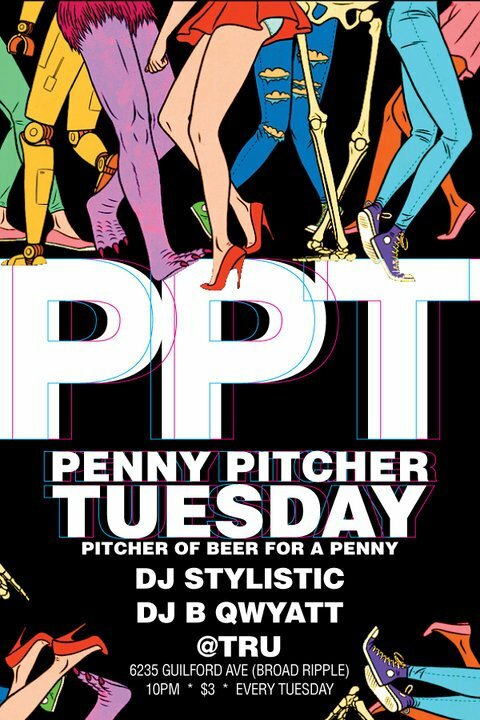 Thats’ right, pitcher’s for 1 penny all night! Come out and support your local business’s and have a great time for cheap! My good friend Evan Black a.k.a Dj Stylistic will be on the 1’s and 2’s. Here’s one of his most recent mixes! Hope to see you there! This is life right now. Send a blessing out to those who ‘make you smile’. I Heard this today inside of a ZARA in miami. It’s by Stee Downes. Enjoy! “Perquisite (Amsterdam, 1982) and Pete Philly (Aruba, 1980) decided to join forces to form the producer/MC-duo Pete Philly & Perquisite in 2003 when they met through a mutual friend. The first result of this soulful coalition was the Mindstate EP, which had it’s release in January 2004 on Unexpected Records. The Mindstate EP was very positively regarded by the international press and recieved airplay on BBC1 were it was played by Benji B. Pete & Perq continued their collaboration and in march 2005 they released their 17-track debut album Mindstate, which was released all over Europe & Japan. It contained featurings by vocalists Talib Kweli, CeeMajor and Senna as well as featurings by internationally known jazz musicians Jesse van Ruller and Benjamin Herman. UK magazine Notion Magazine proclaimed their music to be “as much 21st century soul as Hip Hop genius” and continued with mentioning Mindstate as “one of the most profound Hip Hop albums of the year”. Talib Kweli added that “musically these guys are light-years ahead of the game.” Fulljoy this one! Bless up!